Around 7% of household waste in the UK is glass. Glass manufacturing uses large amounts of energy. Glass can be recycled over and over again and 80% of the raw materials can be re-used. 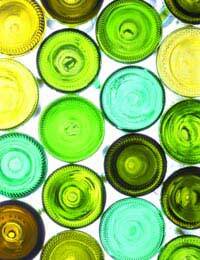 Recycling glass also uses a lot less energy than manufacturing it from scratch. However, by re-using glass as much as possible before it’s recycled you are helping to cut down on the energy used in both making and recycling glass. Glass bottles and jars come in useful in a number of ways around the home. If you have any leftover food it can be stored in wide-necked jars such as coffee or jam jars. If you buy small glass bottles of spices and herbs you can buy re-fills from the supermarket, or in bulk from a weigh house, and refill the jars without having to buy a new glass bottle. Similarly you can use old oil and wine bottles to make and store your own flavoured oils and vinegars. These items last for ages as well. If you know someone who brews their own beer and wine they would probably welcome the donation of bottles. If you don’t know anyone and you like a drink, why not have a go at brewing your own drinks? Glass jars are useful for storage in general and can be used to hold anything such as copper coins (which you can save up! ), screws, pins or buttons. Coloured glass can be used in all sorts of decorative ways. One way you could use it is in a water feature, or as part of a wall. People have been known to embed pieces of glass in cement while it’s wet (for example in a new wall) to create an interesting effect. Some people with craft talent use glass to make jewellery, lamps and oil burners and there are some tutorials on how to do this online. It goes without saying that you need to be extremely careful if you’re breaking or cutting glass for re-use. Wine bottles make great vases. You can steam the labels off and add flowers for a cosy Italian restaurant look. You could also get even more creative and get some glass paint so that you can decorate the bottles and vases. A hand-painted bottle vase would make a thoughtful gift for anyone who appreciates thrifty gifting. Many people use glass bottles and jars in their gardens. They can be used to grow small plants and shrubs, as well as to dry and store seeds. Another good idea is to put small glass jars on the top of bamboo canes so that you don’t poke your eyes out! If you still use a milkman you’ll be able to return your glass bottles and they’ll be re-used again and again. A milk bottle is often used 20 or 30 times before it’s recycled. Some smaller retailers and makers will still use a bottle return and refill system, for example small wine makers or farm shops, so it’s always worth asking about whether a system like this is in place or is feasible.